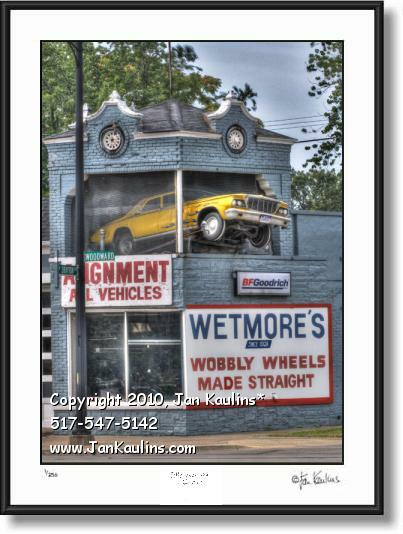 WETMORE'S WOBBLY WHEELS Ferndale, photo art print photograph for sale. Wetmore's Garage photography art prints photos for sale. This is an artistic original photograph created by using 9 seperate bracketed photographic exposures to create this one unique image of the Woodward Ave. landmark, Wetmore's Inc. Wetmore's opened its doors on Woodward Avenue in Ferndale in 1928 and soon realized the advertising value of putting an eye catching vehicle two stories up in the air on their building. Several vehicles have been used in this 'wobbly wheels' display since those early days, including a Hudson Motor Car, a 1940 Buick Cosmopolitan and a 1964 Chrysler New Yorker. This garage with its 'advertising art' is a landmark on the drive up or down the Woodward Ave. strip. This is an original High Dynamic Range (HDR) color photograph created by nationally recognized artist/photographer Jan Kaulins. It is one of the newest artistic images in his most recent series of photographs. Each photograph has been created from nine separate photographic digital exposures and then layered together into one photographic image. It is then ‘tone-mapped’ where individual areas of the photo, as well as contrast, saturation and other qualities of the image can be artistically manipulated to bring out the artistic effects that make these photos so visually unique. Some of the photos in this series are even further enhanced for artistic effect giving them an almost painterly or graphic silkscreened look. They do not look like your grandmothers traditional photos. These photos are however not hand-colored, like Jan’s other photographic series shown on this website. This is a relatively new photography technique which uses the blending of the nine multiple bracketed exposures to capture and emulate the way that light levels in the real world vary over an enormous tonal range, from the brightest area of sunlight to the darkest area in the shadows. All of these varying degrees of light cannot be exposed properly and captured in a single photograph---hence the necessity of layering and combining of the multiple over and under exposures to allow the viewer to see all of the existing areas of light at one time in one photo. The enhanced saturation and color of the multiple images also is a partial result of this very unique photographic process and can be quite stunning and dramatic. Sometimes these artistic Jan Kaulins photos seem to almost blur the sense of reality and illusion. CLICK ON THE LINK BELOW TO SEE PRICES, SIZES AVAILABLE AND ORDER INFORMATION.